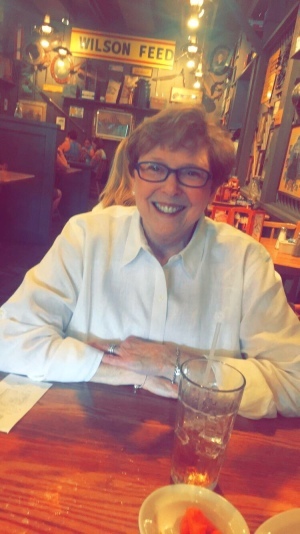 Joan Elizabeth Grabeel, 69 of Athens, TN, passed away peacefully at home on April 5, 2019, surrounded by her family. Born the eldest of five sisters in the Clearwater Community to William Edward and Dortha Mae Key Hughes in 1949, she went to college and lived many years in Johnson City, TN, then Rogersville, TN where she met her husband Frank. She was a nursing leader, serving our country in the Army Reserves. Later, she dedicated 30 years to public health service with the Tennessee State Department of Health, working as a Quality Assurance Cordinator for Southeast Region in East TN until her retirement. Joan curated a beautiful life of love, tradition, and antiques. An avid gardener, she firmly believed there was always room for one more flowering shrub or architectural houseplant. She loved people and their stories. She enjoyed her pets, music, holidays, and family gatherings. She was preceded in death by her parents, Edward and Dorotha Hughes, and sister Judi Hughes Watson. She is survived by her husband Frank Grabeel of Athens, TN; daughter Beth Womac Hatfield and granddaughter Grace Hatfield of Athens, TN; son Nathan Womac and daughter-in-law Dana Bramble of Rock Hill, SC, Dana’s daughters Kailye & Kara Birchfield; step-daughters Virginia (Jack) Copley of Charleston, W. V. and Martha (Nathan) Carmley of Vonore, Tn. and granddaughter Grace Copley. She is also survived by her sisters Mary Long of Morristown, TN, Ann (Russ) Parise of Kingsport, TN, Janice Crabtree of Athens, TN, and brother-in-law Don Watson of Sweetwater, TN in addition to nieces/nephews Jodi (Chad) Rose, Lori (Jason) Baumgardner, Casey (Emily) Long, Russell Long, Katie (Bryan) Walker, James Haren, John (Andrea) Haren, Andrew Crabtree, and Betsy Crabtree. St. Jude Children’s Research Hospital (stjude.org), American Cancer Society (cancer.org), and Shriner’s Hospitals (donate.lovetotherescue.org). There will be a private graveside service with interment at Clearwater Cemetery in Athens, TN, Laycock-Hobbs Funeral Home in charge of arrangements. Condelences may be sent to www.laycockhobbs.com/notices/Joan-Grabeel. Laycock-Hobbs Funeral Home in Athens is in charge of the arrangements.